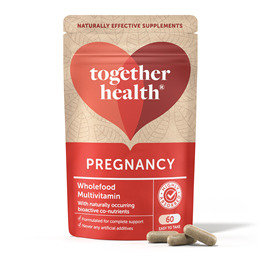 Together’s Pregnancy multivitamin and mineral contains all the whole food goodness of their much-loved WholeVit nutrients. A perfectly balanced combination which fully supports the needs of mum and baby. When vitamins and minerals are in their whole food form, our bodies understand them better and this makes them far easier to absorb. Mineral enhanced yeast* providing: Iron, Selenium, Zinc, Copper, GTF Chromium, Boron, Iodine, Molybdenum and Manganese; Lithothamnion Calcareum seaweed providing Calcium and Magnesium, Lactobacillus bulgaricus** (from milk) combined with Magnesium Citrate, Vitamin C incorporated in citrus pulp, Beta Carotene incorporated in carrot concentrate, Vitamin E combined in vegetable oil, Yeast concentrate* providing: Niacin, Pantothenic Acid, Riboflavin, Vitamin B6, Thiamin, Vitamin B12 and Vitamin D3, Biotin, Inositol and Choline incorperated in corn meal; Folic Acid and Vitamin K2 incorporated in alfalfa concentrate. Capsule Shell (Vegetable cellulose). *A non-candida yeast. No known allergic reactions. **This bacterial species is a native inhabitant of the human GI tract. Two capsules daily as a food supplement with or without food. 100% plant based vegicap may be split and powder mixed with food or drink. Below are reviews of Together WholeVit Pregnancy - 60 Capsules by bodykind customers. If you have tried this product we'd love to hear what you think so please leave a review. Excellent product from together amazing company highly recommend their great products and bodykind is a fantastically run site to purchase these wonderful health enhancers. 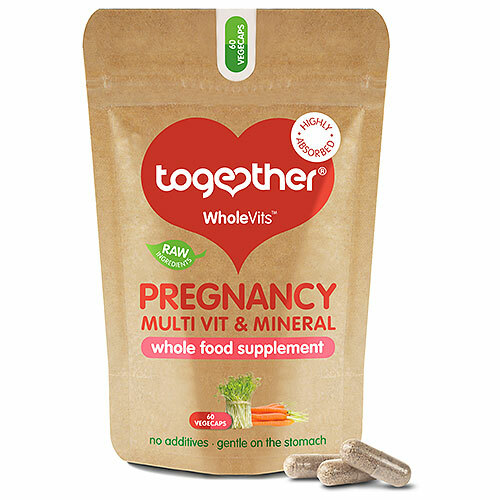 Together’s Pregnancy multivitamin and mineral contains all the whole food goodness of their much-loved WholeVit nutrients. A perfectly balanced combination which fully supports the needs of mum and baby.